Accu-Spec provides energy efficiency services to home builders, home buyers, owners of both new and existing homes, property managers, community organizations, code officials, architects and others in the home building industry. Clients are provided with expert information tailored specifically to their needs and targets a home or building's energy performance, comfort, safety, and durability. Areas served include East Tennessee and Western North Carolina. Drawing upon extensive construction and inspection experience, using fundamentals of building science and advanced diagnostic tools, Accu-Spec uses a whole-house approach in order to identify opportunities to improve a home's energy performance, durability, comfort and safety. By viewing the "house as a system" of integrated components that perform as integral parts of the whole structure, cost effective alternative improvements can be developed. We can provide buyers, homeowners, re-modelers and new home builders with an assessment of the most cost effective ways to reduce the cost of ownership and enhance property value of existing and new homes. Additional benefits include improved comfort and reduced equipment maintenance costs. Home Energy Ratings (HERS) and ENERGY STAR® Homes Certification Accu-Spec is proud to provide rating services (HERS Ratings) to qualify new homes for the ENERGY STAR® label. ENERGY STAR qualified new homes are substantially more energy efficient than homes built to the minimum code requirements. Even in states with more rigorous energy codes, the U.S. EPA ensures that ENERGY STAR remains the symbol for truly energy-efficient performance. These homes are good for businesses, consumers, and the environment. Learn more about ENERGY STAR qualified new homes at http://www.energystar.gov/. Energy Ratings are a point system (or index) by which homes can be compared as to their energy efficiency. The Energy Rating system we use is endorsed by EPA’s ENERGY STAR Program. A home’s energy rating (or HERS) is similar to the MPG label rating used on new automobiles. The HERS scoring index provides a score representing the home's efficiency relative to the same home built in accordance with the residential energy building codes (International Energy Conservation Code or IECC). For example, the home built in accordance with residential building code (a.k.a. the reference home) would score 100 where a home built to ENERGY STAR guidelines may score up to 80 (lower is better) which means it consumes 20% less energy than a similarly built code built house. A home that consumes no more energy than it can offset with alternative energy production would score 0 or “net zero”. More information about the HERS index can be found at the web site http://www.resnet.us/home4 and information about EPA's ENERGY STAR Program for new homes is available at http://www.energystar.gov/index.cfm?c=new_homes.hm_index. Why Should New Home Builders Build ENERGY STAR Homes? Why Do Home Buyers Choose ENERGY STAR Homes Over Conventional Homes? What Improvements Constitute an ENERGY STAR Home? Effective, properly installed and inspected insulation, tighter HVAC duct systems, energy efficient HVAC equipment, energy efficient water heating, high performance windows, energy efficient appliances, energy efficient lighting and other energy efficient products. Many of these improvements are difficult or cost prohibitive to retrofit to an existing house, but when implemented during construction are cost effective. So How Does a Builder Join ENERGY STAR? Go to the website www.energystar.gov and fill out the Partnership Agreement. Contact Accu-Spec Inspection Services to review your house plans for compliance. A review and analysis of building plans and specs is performed to develop a preliminary energy rating and recommendations are made to improve the design and/or specs for the purposes of energy performance and to achieve the required energy rating of 80 or lower. It is recommended that this review take place at the beginning of the project and no later than before the rough-in stage. Mid Construction Inspection - An on-site inspection must be performed after the insulation is installed but prior to the sheet-rock installation. Other mid-construction inspections may occur as needed or as requested during the construction process. Final Inspection - After the home is complete, a final inspection is conducted using state-of-the-art Blower Door and Duct Blaster (if applicable). Display the ENERGY STAR label on each qualifying home and use ENERGY STAR promotional materials to gain market advantage. Site visits during the construction process allow us to make recommendations that are cost effective and will enhance performance of the home. These recommendations will address framing, insulation, air-sealing, and ventilation strategies, as well as decisions on purchasing energy saving, ENERGY STAR labeled products, appliances and lighting fixtures. As a homeowner, have you ever considered installing Solar Panels, Wind Turbines or some other alternative energy source to your existing home? Then, you should consider having an Energy Audit or Rating first to determine what other lower cost improvements should be made prior. Why spend additional thousands of dollars on solar panels to install them on a leaky, inefficient house? The "low hanging fruit" is spending hundreds (comparatively) of dollars on making the home more energy efficient, then, buy the right sized alternative energy system. Tighten up the house first and save money on a smaller, less costly but just as effective solar panel or wind turbine system. Whether it is a new home in the planning or construction stages or an existing home, a comprehensive home energy audit can provide clear guidance toward the most practical cost-effective ways to maximize the home's energy efficiency from a "house as a system" approach. Our weatherization audits and home energy rating audits take into account all energy being used in the home including heating and cooling, water heating, major appliances and lighting. 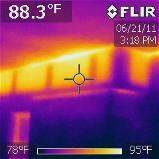 During our site visits, we can verify that framing and insulation components are performing to their maximum potential using Infrared Camera Analysis. Infrared Camera Analysis helps us to target leaky areas and poorly insulated areas of a home for improvements, ensuring a warmer home during the winter and a cooler home during the summer months. Homeowners receive on-site inspections as well as a computer-generated report detailing cost-effective home improvements that can dramatically increase the energy efficiency of the home. Often sales persons will approach homeowners promising unbelievable energy reductions through the purchase of their products that may or may not help reduce energy. As third party energy raters and auditors, we do not sell or promote any specific brands, particular products or fuels, so you can rest assured that our audits are unbiased and will only recommend improvements that will pay-back in energy cost savings. Often homeowners are surprised to find that low cost fixes are more energy efficient than more costly or expensive ones. For example, spending money on expensive improvements, like window upgrades, often is not cost effective from a SIR (saving to investment ratio) analysis point of view. The FHA recognizes and endorses using a RESNET professional energy rater (HERS Rater) to model a home and provide a Confirmed Energy Rating. All of Accu-Spec energy audits and home energy ratings employ the use of air-infiltration testing. Blower Door test equipment and duct leakage testing using a Duct Blaster. The most practical way of estimating air infiltration or air leakage within a home or building's shell is through the use of Blower Door testing. Air leakage in a home can account for up to 40% of a home's cost of heating and cooling. 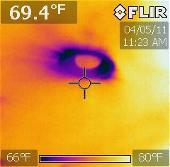 In addition to estimating the rate of air-infiltration within a building, when used in conjunction with a Thermal Imaging Camera, the blower door is an effective way of locating the largest and most costly leaks in a home. Using infrared technology inspectors can diagnose insulation and moisture problems using technology to investigate building components by a less invasive means. We typically perform this test in conjunction with a blower door to determine the location of leaks and missing insulation. This technology helps us to pinpoint improvement areas for homeowners, contractors or their sub-contractors. 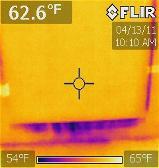 The images below were IR images taken of new homes less than 1 year old. 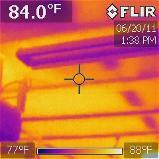 Areas shaded in yellow in the upper photos show hot attic radiation on hot summer days. 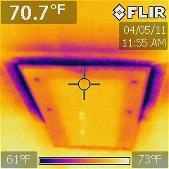 Lower pictures are of cold winter air infiltrating leaky attic accesses and a recessed light. Note: Pictures were taken with the blower door running. The Duct Blaster is used for testing duct-work of forced hot air heating systems and central air conditioning systems. It is used to test for duct leakage in houses and light commercial buildings. Leaking duct systems are a major source of heat loss in existing and new homes, and can account for as much as 30% of a home's total heat loss. In addition to reducing the effectiveness of heating and cooling systems, resulting in some rooms that are too hot and others that are too cold, duct leakage can be unhealthy. Leaks in return ducts can draw in pollutants and other irritants creating indoor air quality problems. When used in conjunction with the blower door, the Duct Blaster can be used to determine total duct leakage to unheated areas; or, how much costly "conditioned air" is being lost to the outside. As a new home buyer, you may be able to use FHA’s Energy Efficient Mortgages (EEM). These mortgages give credit to home buyers for buying energy efficient new homes based on their HERS Energy Rating. Home buyers and owners of existing homes can take advantage of FHA’s Energy Improvement Mortgages (EIM). Energy improvements can be financed into the same loan when purchasing an existing home or refinancing your current mortgage. FHA’s EEM program recognizes the monthly utility cost savings when home buyers make energy-efficient improvements. Borrowers may use the EEM program to finance the cost of energy efficient improvements into their new mortgages, without the need to qualify for additional financing, because cost effective energy improvements result in lower utility bills making more funds available for their mortgage payments. With an Energy Efficient Mortgage, you can buy more home rather than buying more energy year after year.